The Spectrum SCT Timing Tool (SSTT) can provide you with a basic validated signal calibrating your need to consult a stem cell transplant team. To get started, all you’ll need is a copy of your latest Complete Blood Count. The SSTT gives you the option to consider additional risk factors from the DIPSS+ scale and the World Health Organization criteria. Your basic risk score, however, is derived from the Dynamic International Prognostic Socring System (DIPSS ). Answer all questions you can. In reviewing results with your hematologist ask about the need to consider any additional data. Grade 2. Dense reticulin with collagen or osteosclerosis Y.
and SRSF2M, Triple negative (MPL, JAK2, CALR ) Discuss with physician. If score is 2-3: Patient is consideredintermediate-2 risk. Median survival is estimated to be 35 months. (DIPSS: 4 years). 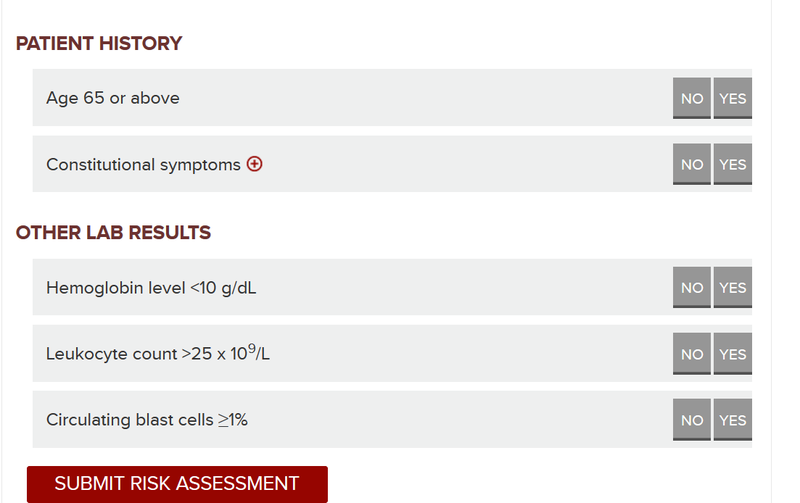 If score is 4 or more: Patient is considered high risk. Median survival is estimated to be 16 months(DIPSS: 2.3 years). DIPSS scoring differs. Fewer factors, different median survival.